RANGE: Breeds locally on the Atlantic Coast from southern New Jersey south to southern Florida, and from southern Oregon, southern Colorado, central Kansas, the Gulf Coast of Texas, and southern Louisiana south to South America. Winters from central California, the Gulf Coast of Texas and Louisiana, and southern Florida south to South America. HABITAT: Inhabits shallow freshwater and brackish ponds, alkaline lakes, wet meadows, open marshes, and flooded fields and pastures. 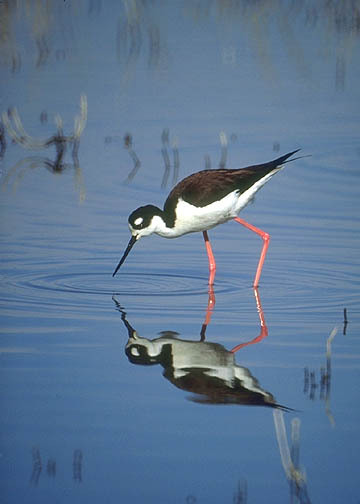 Commonly associates with other shorebirds, especially avocets, godwits, and curlews. SPECIAL HABITAT REQUIREMENTS: Shallow wetlands. NEST: Nests in slight depressions on the ground, on sandy or gravelly shores, or along drier margins of ponds and lakes, or on deep, well-built, floating platforms over shallow water in loose colonies. Also nests on hummocks, on small islands, or under clumps of vegetation and may be well concealed or in the open. FOOD: Forages along muddy shores and in shallow waters for dragonfly nymphs, caddis flies, mayfly nymphs, flies, billbugs, mosquito larvae, grasshoppers, crayfish, and snails. Also consumes small fishes and seeds of aquatic and marsh plants.